If your mole is affecting your confidence, you may be able to have this safely removed at our clinic to leave you skin looking smoother. Our mole removal treatments are fast, effective and have little downtime. At CAREFORSKIN we can remove moles using a number of methods, including laser removal, shave or excision. We will assess the the mole at your consultation to determine its size, shape and character to determine the best removal option. We can remove moles in virtually any part of the body. Our laser removal system uses energy to remove the mole. Other options include shaving the mole using a local anaesthetic. Alternatively we can also cut away the mole. This procedure is also performed under local anaesthetic and will will require a small stitch, to close the treated area. Procedures take between 20-30 mins, and there is minimal downtime. We will also provide you with a follow-up review. Moles can be safely removed for cosmetic reasons to leave your skin looking smoother and mole-free. Laser Removal – Our laser can be used to breakdown the pigmentation in the mole using light energy. Shave – this approach effectively shaves away the mole and is performed under local anaesthetic. We can remove unwanted moles in virtually any part of the body. A single treatment is required and will last between 12-18 months. 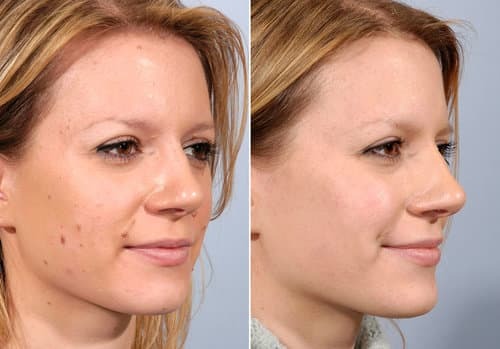 Results are visible as soon as mole is removed or reduced after the procedure. Excisions will produce a scar. However forms generally do not. We will be able to discuss this further during your consultation. Generally there is no downtime and you may return to activities with care. If the mole is shaven or cut-away it feel like a graze after the anaesthetic has worn off. The treated area may also become red and the edges may be slightly inflamed and raised. This is part of the healing process.